The euro vs dollar pair continued their short squeeze higher last week in a series of small steps, holding above both the 9 and 14 day moving averages but failing to breach the key 40 day moving average which now sits immediately above. With very little in the way of fundamental news today and thin trading conditions then expect to see a narrow trading range but it is interesting to note that in early trading so far the high of the session seems to have resistance at the 40 day moving average. 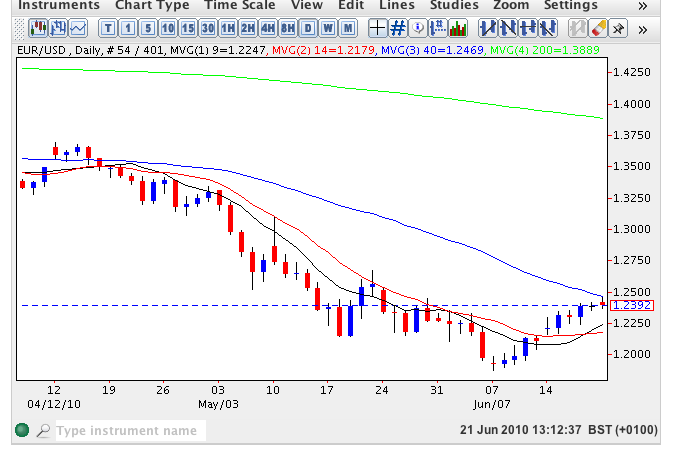 For any continuation of this squeeze USD1.25 appears to be the limit but should it break above here then the 40 day moving average could provide a critical indicator of support. With only a speech from Jean Claude Trichet later today which may have some effect markets are generally very thin this week as they wait for the G20 at the weekend and absorb China’s statements regarding the strength (or otherwise of the Yuan).